Ergonomic desk chairs are more than just additions to a workspace: The Occupational Safety & Health Administration recommends the use of ergonomic chairs that foster a neutral, comfortable working posture. Ergonomics not only promote good posture and, in turn, physical health, but can create a more pleasant work environment that promotes productivity. One of the most important aspects of ergonomic seating is the height of the chair. Sitting in a chair that is too low can force one to raise the arms to reach the keyboard, causing strain in the neck, shoulders and upper back. It also encourages rounding of the spine and places added tension on the tailbone and buttocks. Adversely, seating that is too high places pressure on the thighs and back of the knees, cutting off circulation in the lower extremities. Stand up in front of the chair and raise or lower it so that the top of the seat cushion when parallel to the floor is at a height just below the knee cap. Sit down on the chair with feet flat on the floor. Ensure there is about 2 inches of clearance between the front edge of the seat and the calves. Achieving this may require you to adjust the tilt. 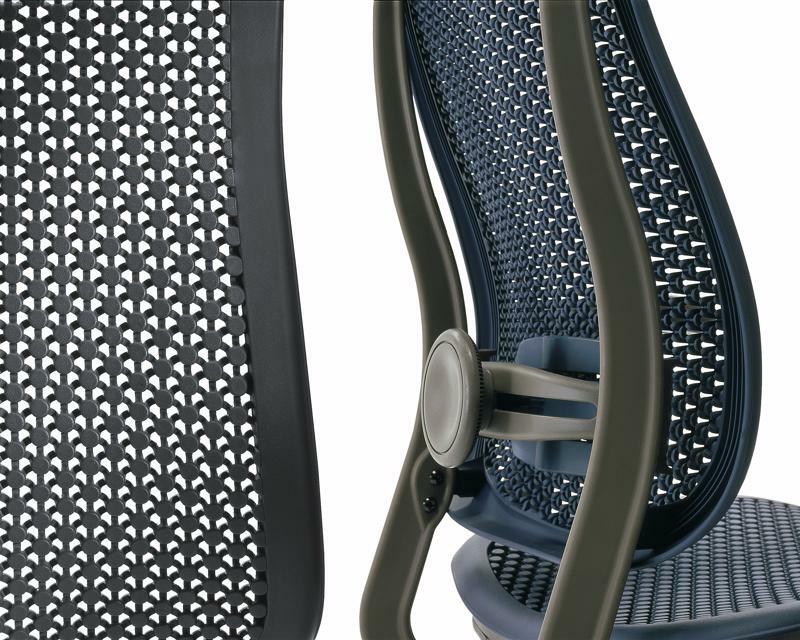 The Herman Miller Aeron chair has a tilt function that echoes the natural body mechanics. In general, a slightly forward tilting chair is the most comfortable for basic computer usage. However, variation is key to avoid placing continuous pressure and strain on certain parts of the body. A backward tilt allows the user to recline slightly, and a horizontal seat is ideal for sitting erect and upright. 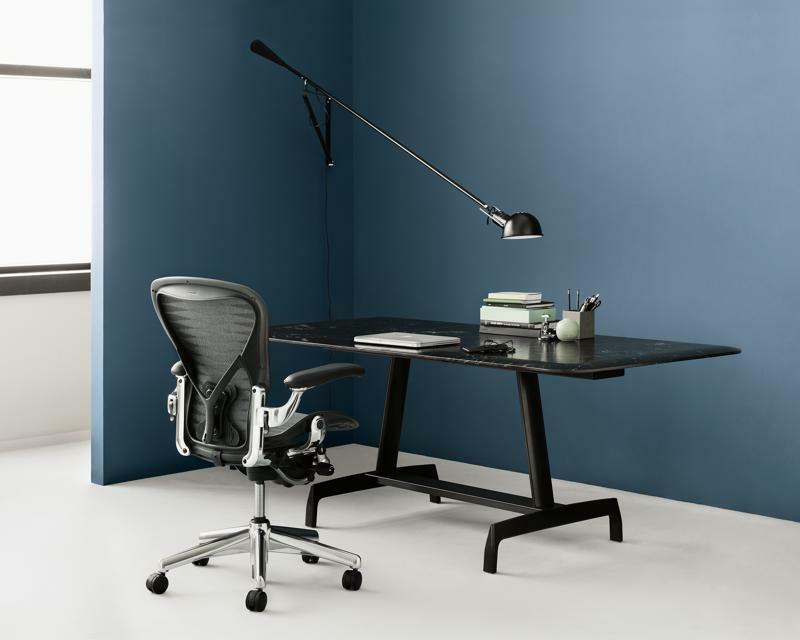 Since tilt should be adjusted regularly to mix up position, the key is to select an ergonomic office chair that is highly flexible and easy to adjust quickly while still providing a frame that disperses pressure and allows the feet to sit flat on the floor. 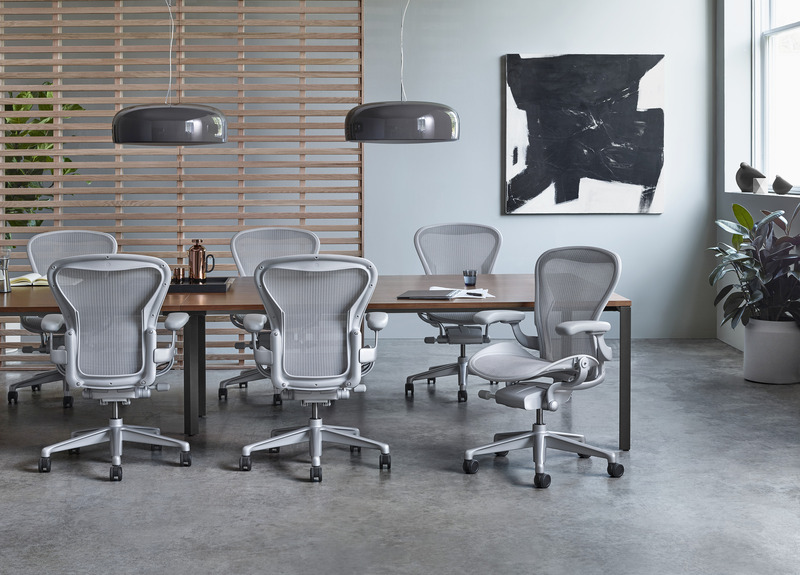 For example, the Herman Miller Aeron chair is designed with a tilt action that echoes the body’s mechanics and provides support that stabilizes the pelvis for a natural curvature. 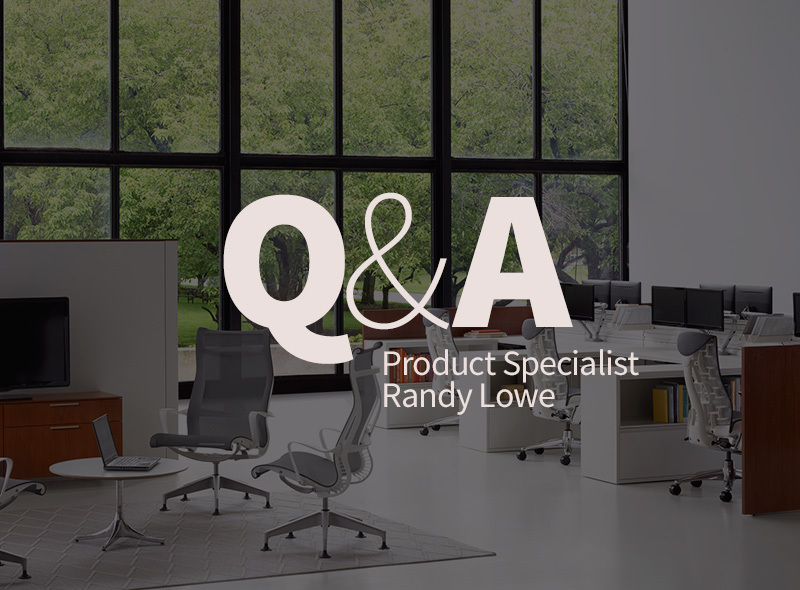 Adjustable armrests are an important feature to ergonomic office chairs, as improper arm positioning can lead to strain in the neck and shoulders. When armrests are too low, the user might be more inclined to slouch forward to rest his or her limbs. If too high, the user may be forced to hunch the shoulders when placing the forearms on the rests. The proper armrest height for good ergonomics should be at around the same height as the point of one’s elbow when bent at a 90-degree angle, according to OSHA. This positioning allows one to place his or her forearms on the rests with the arms slightly lifted at the shoulders, taking weight off the shoulders and shifting it to the elbow. Adjustable lumbar support allows you to easily alter the chair back to conform to your spine’s natural curvature. Perhaps the most essential feature of an ergonomic office chair is lumbar support, which minimizes tension on the back and prevents slouching. The aim is to match the backrest to the contour of the spine when seated in a neutral position. You may need to adjust the backrest by raising or lowering it so that it fits snugly in the natural curvature of the spine and pushes the back forward. 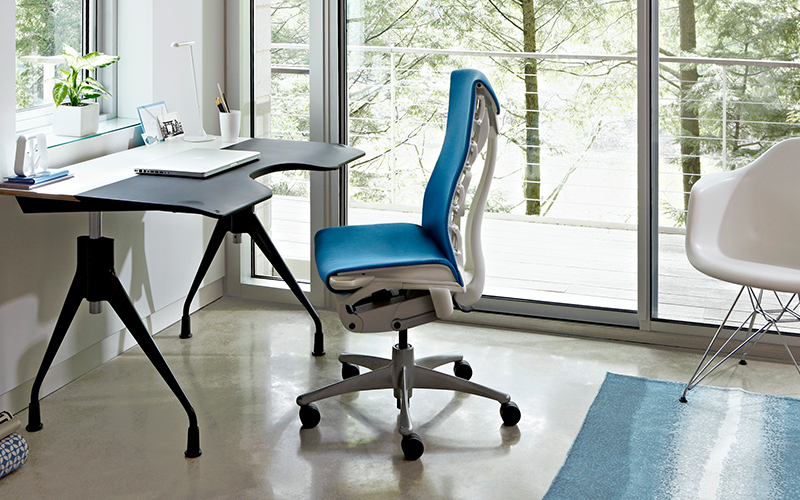 However, high-end chairs such as the Herman Miller Celle provide a lumbar adjustment function. The lumbar support should feel firm, and you should not feel any pressure points in the back. 4 reasons office pets are a great idea!